No matter how big Facebook gets, I stand on my ground not to create a personal Facebook account. Although I am able to find a lot of old friends through Facebook but I don’t want to risk my personal information being used by anyone. Moreover anyone, especially your enemies can create a fake identity and spread bad things about you. You can try reporting the violation but most of these cases are being ignored unless you can get 2000 people to help you report it. If you ask me if I have a Facebook account, yes I do have one without any personal information in it and it is only for the purpose of creating a Raymond.CC Technology Blog page so that I can share updates. Yesterday after publishing the post about DirectX Happy Uninstall, I had problems in sharing the link in my wall. I have no problems attaching a link but when I click the Share button, an error saying “Something went wrong. We’re working on getting it fixed as soon as we can” is shown on the page. From the looks of this error, it seems like a generic error because it doesn’t have any error code, or specific explanation to the problem. I also doubt that Facebook engineers are actually getting it fixed as soon as they can. So I’ve decided to investigate on this Something Went Wrong problem. I searched in Google and it appears that this problem has been ongoing for a very long time. Some people get it and some don’t. Anyway, my first suspect is that the cookies or cache has been corrupted so I used another web browser and surprisingly I was able to share this time without any problems. Then today I tried to share a link and I got the dreaded something went wrong error again! Clearing the cache/cookies and changing to a different web browser did not solve the problem this time… At least I now know for sure that this problem is not caused by my computer. I noticed that this problem only occur when the Post Update only shows 2 methods of sharing which is Post and Link. After playing around with Facebook for a couple of minutes, I got lucky and found the cause of something went wrong in Facebook problem. 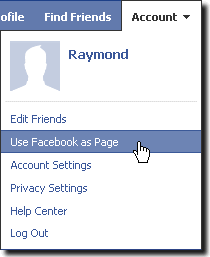 The rule is you have to create a Facebook account first in order to create a page. After created a page, you’re automatically an admin of the page. Now, if you haven’t noticed, you can switch between “Use Facebook as Page” and “Switch back to YourProfileName” from the Account drop down menu at the top right. I noticed that when I am using facebook as my profile, sharing a post or link to my page will cause the error. All I need to do is switch to Use Facebook as Page and I can share status, photo, link, video and question to my page, instead of just seeing post and link. The official Facebook page for this blog is https://www.facebook.com/www.raymond.cc. Do help to click on the Like button at our Facebook page if you have a Facebook account. Well done on this discovery. All other Google search results did not help at all. @Raymond & Dave …. I wholly agree with your jaundiced view of FB. I have an anonymous account in a 100% ficticious name PURELY to walk through the many helpful online tips on how to bolt an account down … so with hands on experience I can guide others. The potential hazards of FB (and their ilk) beggar belief and frankly, Zuckergerg’s belief that he is some sort of J.C. Superstar is jaw dropping in its arrogance, naivity and irresponsibility. He could have produced something useful but instead cynically evangelizes that “people are not interested in privacy anymore”. Anyone who thinks that he is developing FB for anything other than a fat sale is living in cloud cuckoo land. I started compiling a dossier of the faults and dangers of FB for clients but quickly realised it was a full time job keeping up with online reports. The West is almost a police state like China, Russia and the USA without Zuckerberg and his playmates adding to things – especially when those outside the USA read up on the implications of data stored “in the cloud” by USA based companies and the wide ranging powers of the Patriot Act to totally ignore safeguards written into (for example) European Data Protection Acts. All of that notwithstanding, keep these helpful tips coming Raymond. Some say “In God we trust” …. I say “In Raymond we trust”. The first time i ever had this problem was when i logged in my main account on the same browser and open 2 tabs of the FB page, then logged out in one of the tabs and re-logged with my secondary account. After a while i got the same error message even though i didn’t click on anything. I steer well clear of such sites. I’m sorry folks, but the very thought of so-called “social networking” leaves me totally stone cold. Why anyone would want to bare their souls in every detail to all and sundry and/or air their dirty linen in public is beyond me, not to mention the attendant identity theft risks. So if you want to Like (share) a site on your Page you have to actually post a link to it instead. I don’t have a FB page, but I have encountered the problem occasionally when I try to post or link to a website from my FB profile.